Pet grass seeds are easily grown indoors all-year-round and can be served at the peak their freshness. Pet ferrets, parakeets, bunnies, turtles, lizards, and iguanas also enjoy nibbling at our grasses. Adds roughage to your pet's diet providing health benefits such as adding fiber and vitamins to your pet's diet. Fiber and vitamins are vital to the overall health of your pet. Can help keep your pet away from dangerous plants - Providing your pet with pet grass can help prevent them from nibbling on toxic plants. Pet grass provides pet owners with an affordable and safe way to enrich their pet's diet, eliminate hairballs and keep them safe from toxic plants. A common medical condition affecting pets is the dreaded hairball. Hairballs are matted or entwined balls of hair that form in your pets stomach or intestines. Hairballs that can't be digested or coughed up account for a large percentage of pet digestive blockages and can make your pet sick or even worse, can be deadly. How Do Pets Get Hairballs? Pets get hairballs mainly as a result of grooming themselves. Although most pets seem to have a strong dislike for getting wet, they do like keeping clean and will frequently clean themselves by licking their fur. Their tongue makes it easy for them to snag their hair and swallow it as they groom. While pets with long hair are more likely to suffer from hairballs, short haired pets may develop hairballs as well. Hairball symptoms include frequently attempting to vomit; changes in eating habits or digestion; and/or a swollen abdomen. If your pet is suffering from any of the above symptoms, it could very well be a pet hairball problem. Although there is no "cure," there are several preventative measures that can be taken to minimize your pet's hairball problem. Brushing and grooming your pet frequently is one solution that may help prevent hairballs by getting rid of dead hair. The more you brush and groom your pet, the less hair it will swallow when it grooms. Another solution is growing pet grass for your pet. 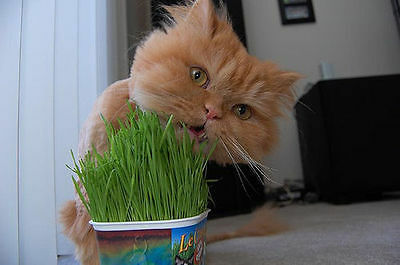 Pet grass can help eliminate hairballs by adding fiber and vitamins to your pet's diet. A high-fiber diet can help prevent the formation of hairballs. Hairballs that can't be passed through your pet's digestive system or coughed up may require surgery or other treatment by a veterinarian. When in doubt about the health of your pet, you should consult a qualified veterinarian specifically trained to help keep your pet healthy and safe.